This page contains information about generating and sending Invoices with UCM. invoice_print: used for printing the PDF invoice. Add your company name, contact details and logo here. invoice_task_list_basic: the task list that goes with the basic invoice template. If you wish to edit the default template invoice_print you can rename it to invoice_print_mine so that you still have access to the default template. Advanced: overwriting the default invoice_task_list generated HTML content. The file includes/plugin_invoice/template/invoice_task_list.php generates the invoice task list for both the "external" and "PDF" invoice documents. There is a lot of PHP in this file to generate the output based on the invoice_task_list template available in Settings > Templates. Option 1) Copy the includes/plugin_invoice/template/invoice_task_list.php file over to a new folder called custom/includes/plugin_invoice/template/invoice_task_list.php and make your changes to the custom file. This will stop UCM overwriting your custom changes on update. You can create multiple PDF templates (Settings>Templates) named invoice_print_* (eg: invoice_print_foo, invoice_print_bar or invoice_print_mine) and these will appear in a drop down list in the Advanced area of an Invoice. If your custom PDF template is called invoice_print_mine then you can create a matching task list template called invoice_task_list_mine (notice how the "_mine" bits are the same). To set the name of the default invoice template change the advanced configuration variable 'invoice_template_print_default' from 'invoice_print' to something else. If the "Automatic Overdue Emails" option is selected then any newly created invoices will have the "Auto Overdue Email" checkbox ticked by default. The automatic email will be sent 3 days after the Due Date, and it will be re-sent again 7 days after (and 7 days after again, and so on...). Changing the re-send option to 0 will disable resending so only the first overdue reminder email will be sent. This will let you know that an invoice is about to be sent an overdue notice so you can double check that payment wasn't already received. 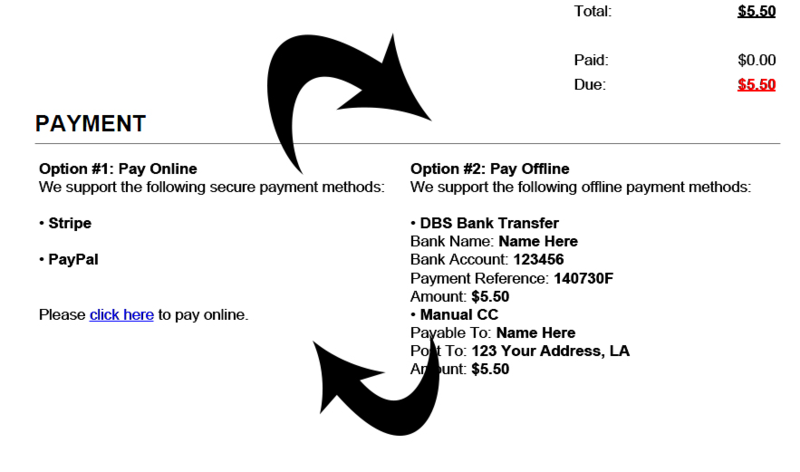 If the "Automatically Renew" option is selected then the Invoice will automatically renewl on the selected Renewal Date. If the "Automatically Email" option is selected then the Invoice will also be automatically emailed to the Customer when it is automatically renewed. Note: an invoice will not be renewed if it has not been paid, this is to stop multiple overdue invoices from getting created within UCM. This will give you notice and let you cancel a renewing invoice if need be (eg: the customer is gone). You can login to your PayPal account to see all active subscriptions, and cancel a subscription if need be. Stripe now supports recurring payments (just like PayPal). To enable this please go to Settings > Payments > Stripe and follow the instructions. If you notice any issues with this new feature please get in touch and we can sort it out asap. The various invoice_payment_* templates under Settings > Templates control the output at the bottom of invoices. Save the template. Open up an invoice and confirm it works as expected.